This was actually one of Monkey’s Christmas gifts. Yep, I am really THAT slow. It actually was a pretty easy project and only took two hours or so, minus drying time. When I, or Santa, gave it to him… well, he didn’t really play with it much. I’m not sure it’s just because there were so many new toys or if he was still a bit young for the whole putting it together thing. 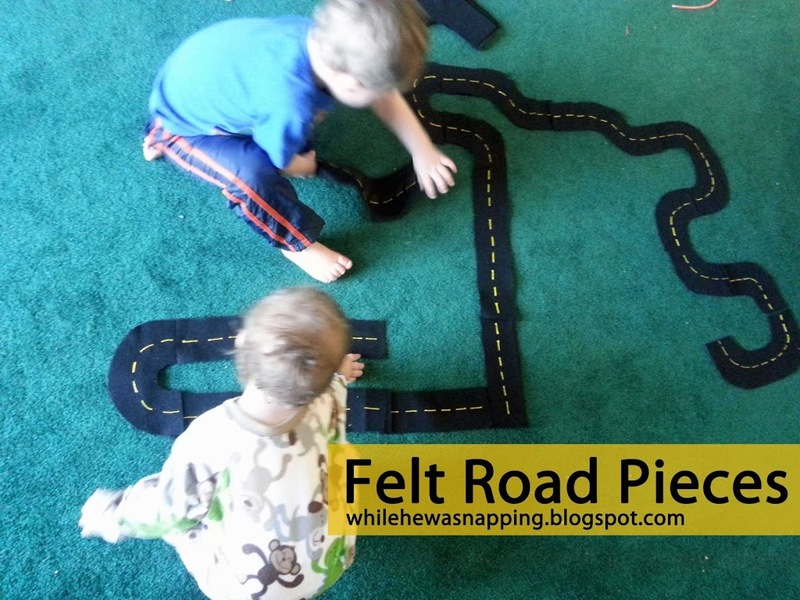 But he loves this felt road set now. – Good scissors – they don’t have to be good, but it’ll make your life easier! 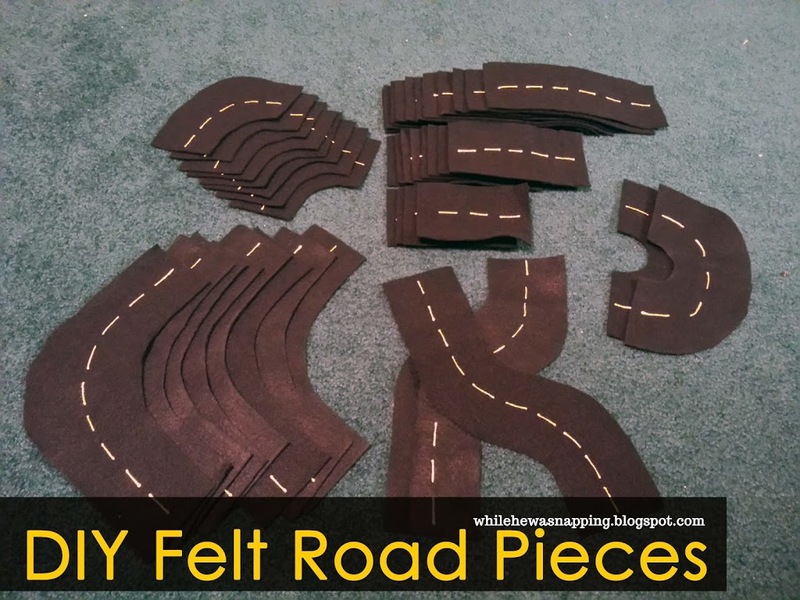 – I just free-handed the different shapes and lengths of road pieces. I used a piece of chalk and drew the shape, making minor adjustments until I was happy with it. – Once all the pieces are cut out, lay them out and draw the yellow lines down the middle of each piece with the puffy paint. Let them dry completely. The only pieces you need to put lines on both sides are the swoopy pieces. You are a genius! I love this so much!! Thank you for this, I can’t wait to start for my little guy! So glad you like it! My boys LOVED it for a long time… they’ve since moved on to Lego. But my youngest is approaching a little more structured play with cars and I can’t wait to get these out again. I hope you love them! Could you give an approximation of size for those of us who are wanton to try to make our own? Inches wide? Lengthen estimate? I would actually suggest placing two of the cars you intend to use with the set on the felt side by side and using that to get your width. That way, you’ll know it’ll fit your set. If I had to approximate, I’d say 3.5 to four inches wide, depending on the cars you use. I would base your length measurements on whether you use sheets of felt or a large single piece and do whatever fits best on the material you’re working with. I’ve seen those you print out but by the time I laminate them they are going to slide all over the classroom floor. I like this idea because it will ‘stick’ to the carpet and is easy to store. What do you think about running a yellow thread down the middle of each piece. I’m not to steady with the paint so the lines might be crooked. Then each piece would have lines on both sides if you needed them to. Sounds like a good idea to me. 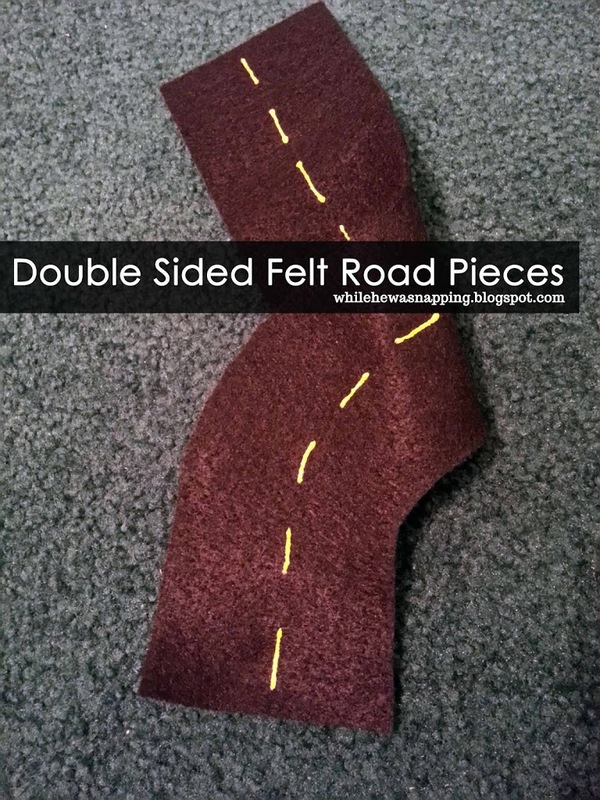 The only thing I’d hesitate on is that the thread might get pulled on and stretch your felt. That’s the only possible problem I might foresee. I’ve made several of these and it’s really not so bad if the lines aren’t straight. My kids don’t even notice and I’ve never had anyone complain about it before. Good luck! Such a cute gift idea for little boys! Love it! Seriously, this is awesome! I was just thinking yesterday that my son needs something like this for his cars. Yay! Thanks for sharing! Love it! Thank you for the great Tutorial. love love love these! so cool?! great job girlie!!! I love this idea! My son would love this! Definitely pinning. Thanks for sharing! Pinned! My kids would love these! Your kids are very lucky. Totally love this! Are you selling in your etsy shop? Please…? 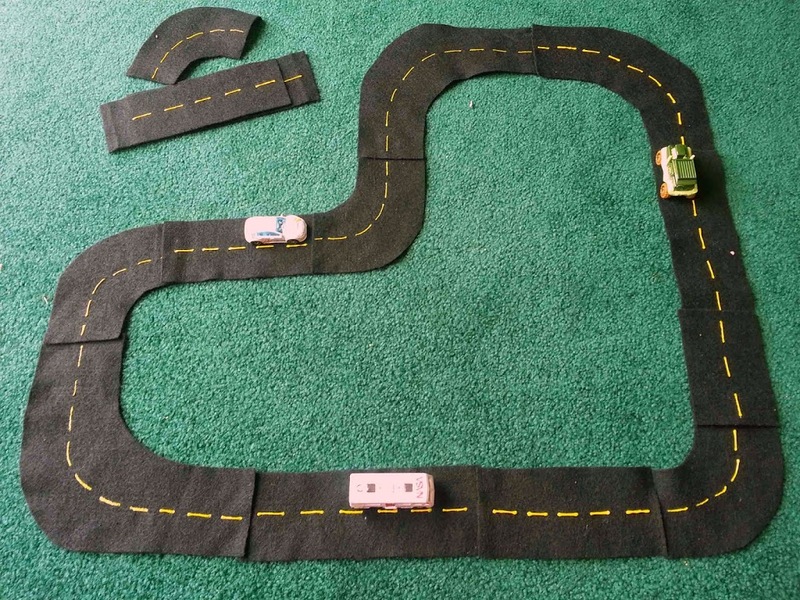 It’s available here: Kid’s Felt Road Track Set.